Now these lions are living free, in family prides, in massive natural enclosures at The Wild Animal Sanctuary in Colorado and ARK 2000 in California. 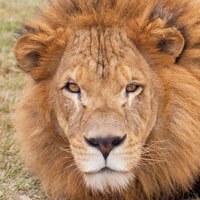 Our rescued lions now live in family prides, and roam vast enclosures in the United States. From rusting cages to vast expanses, read about how ADI carried out an incredible investigation, achieved world-first legislation, and carried out a record-breaking rescue operation to bring them to a new home.